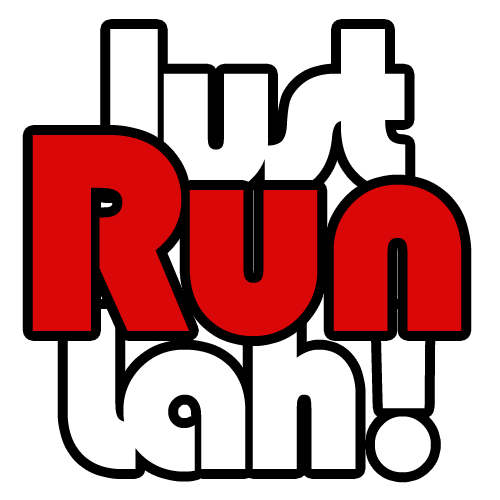 Participants Salute to Honour National Servicemen at SAFRA Singapore Bay Run & Army Half Marathon 2017 | JustRunLah! Participants of the NS50 Team Run and SAFRA 5km Fun Run paid tribute to national servicemen with a salute in commemoration of NS50. Singapore 20 August 2017 [Media Release] It was a meaningful morning for participants of the SAFRA Singapore Bay Run & Army Half Marathon (SSBR & AHM) as they joined the nation in saluting past and present national servicemen for their contributions in defending Singapore. Runners participated in a special salute segment before being flagged off at Esplanade Bridge. The event which commemorates 50 years of National Service (NS50) and also celebrates its 25th edition this year attracted over 41,000 participants. The event was hosted by Minister for Education (Higher Education and Skills) and Second Minister for Defence Mr Ong Ye Kung, who flagged off the NS50 Team Run and the SAFRA 5km Fun Run. Mr Ong is also the President of SAFRA. The NS50 Team Run was a new category introduced this year to encourage past and present Singapore Armed Forces (SAF) Operationally Ready National Servicemen (NSmen) to reunite and rekindle the close camaraderie forged during their NS days. It attracted over 2,500 participants who ran 5km in teams of 10 runners each, clocking a total distance of 50km per team to mark NS50. Also participating in the NS50 Team Run for the very first time was a special contingent of over 50 runners comprising students from the National Cadet Corps (NCC) and their fathers who are NSmen, echoing the NS50 theme, ‘From My Generation To Yours’. The event also gave NSmen the opportunity to reminisce while their families got a glimpse of Singapore’s unique NS experience. The story of the nation’s NS50 Journey was captured in a display of nostalgic images along the running routes, featuring significant moments such as the haircut on enlistment day and the rifle presentation ceremony to recruits. Giant inflatables inspired by the SAF’s Standard Obstacle Course were also featured at the event and proved to be very popular among families. These included the inflatable Stepping Stones along the SAFRA 5km Fun Run and another inflatable course featuring the Ditch, Window, Dodging Panels and Tunnel at the post-run Carnival held at the Padang. Even the little ones participating in the Families for Life 800m Challenge had the opportunity to don Army-themed attire with their parents and camouflage their faces. The category was flagged off by Senior Minister of State for Defence and Deputy President of SAFRA Dr Mohamad Maliki Bin Osman, after he completed the 21km AHM. The 21km AHM Men’s was won by Mr Melvin Wong with a timing of 1 hour 16 minutes 25 seconds. 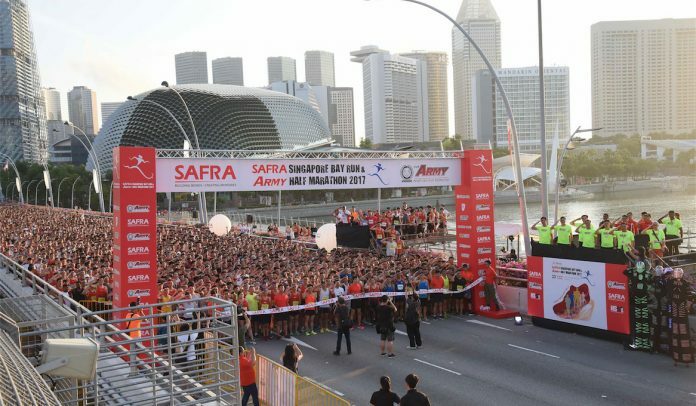 Three hundred SAFRA Running Club members also participated in the 21km AHM and the group gathered in an NS50 formation after the run to pay tribute to past and present national servicemen with a salute. For the first time in SSBR & AHM, the families of NSmen were given a chance to try out the various exercises used by the Army to train strong soldiers. Located at the Padang, the Soldier Strong booth allowed parents and children to test their strength and endurance while trying the 5-ton tyre flip, battle rope and sandbell lift. The Army’s professional instructors and EnergyOne gym’s fitness trainers were present to provide an in-depth explanation on the Army Soldier Strong training. Families also had the opportunity to get a taste of the field rations that national servicemen eat when they are on outfield training exercises. There were also other fun-filled activities such as the Wipe-out. The Music & Drama Company entertained participants with a series of NS50 songs. The SSBR & AHM is jointly organised by SAFRA and the Army to promote fitness and bonding among SAF active servicemen, NSmen and their families.